In anticipation of the publication of my review of Huis Marseille’s exhibition Apartheid & After – to be published in Camera Austria International No. 126 (June 2014) – I’m finally publishing here my review of Okwui Enwezor’s ambitious show at ICP in the fall of 2012. Two important concepts in present-day anthropology are agency and voice, designating oppressed or marginalised people’s own views and understanding of their lives, rather than authorities speaking for them. While these concepts usually imply the written or spoken word, it is interesting to ask to what extent the mere act of being photographed is capable of giving subjects their own voice and agency. Ariella Azoulay, today’s foremost theorist of intricacies of photography in contexts of extreme political repression, wrote in The Civil Contract of Photography (2008) that people in disaster zones can make “emergency claims” by cooperating in the act of photography, thereby joining “the citizenry of photography” (where ultimately no sovereign power exists), simply by consciously staring back at the photographer. Yet much of the interpretation and reading of photographs showing people in conflict zones is guided by how these images are framed, captioned, and published—events these subjects usually have no say in. One of the many black pages in recent history is the period of apartheid in South Africa (1948–94). The academically titled exhibition “Rise and Fall of Apartheid: Photography and the Bureaucracy of Everyday Life” is wide-ranging and extensive, consisting of over 500 photographs, slide shows, videos, and films. Curated by Okwui Enwezor with Rory Bester, it is spread out over all galleries of the (ICP) International Center of Photography in New York City and represents an attempt at examining “the legacy of the apartheid system and how it penetrated even the most mundane aspects of social existence in South Africa …” It is not so easy to find this notion reflected in most of the curatorial choices. Already the type of photographs chosen to occupy the spine of the exhibition, on the high walls along both sides of the central stairway, show otherwise: photographs of people on the streets engaging in protest, bearing signs with written or printed statements, reading for instance: “We are dismayed”, “Release Mandela”, “We stand by our leaders”, “Stop Police Terror”, and “Botha Stop! Killing S.Africa!”. These are very conscious acts of people demanding a rightful place in the public sphere, and the right to be equals among one another, thereby employing simple but powerful means of self-chosen agency, through the use of clearly legible slogans. Through photographs, whose effects become powerful just by reproducing these written claims and the faces and poses of the people showing them, these public manifestations of non-violent protests are transformed from a once urgent and actual struggle into lasting testimony. Eli Weinberg, Crowd near the Drill Hall on the opening day of the Treason Trial, December 19, 1956. Times Media Collection, Museum Africa, Johannesburg. Many other photographs on show—mostly South African-born photographers and journalists, among them Peter Magubane, Sam Nzima, Ernest Cole, Ian Berry (UK), Jürgen Schadeberg (a German immigrant to South Africa), Omar Badsha who founded the agency Afrapix, and the photographers of The Bang Bang Club, who documented the civil unrest and the violence during the transition of apartheid to democracy—present scenes of intense struggle unfolding in the public sphere. Also present are Sam Nzima’s 1976 photographs of thirteen-year-old Hector Pieterson, who was shot dead by police during the Soweto student uprisings, carried in the arms of Mbuyisa Makhubo. 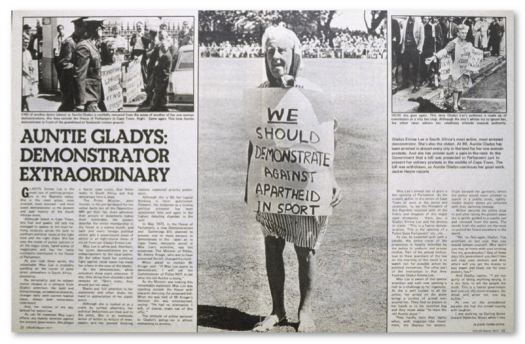 These pictures—after being smuggled out of the country, and through multiple international publications and appropriations—became iconic for the resistance to apartheid’s increasingly absurd laws. 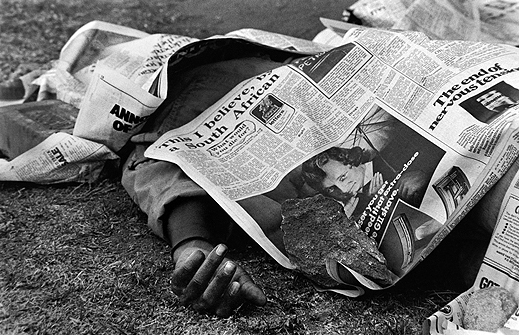 Peter Magubane, Dead bodies covered by newspaper filled the streets of Soweto during the 1976 riots, June 1976. Courtesy the artist. Among the bound publications on display are a few original 1950s editions of the energetic DRUM magazine (originally The African Drum), a lifestyle and investigative news periodical modelled after Life, which primarily catered to educated urban blacks and became a very important platform and tool helping young and most often black photographers develop a sharp eye towards the injustices of the apartheid system. In many individual photographs, as well as series, we are kept in the dark about contextual information which could have taught us more about their social biographies—tracing histories of publication, censorship, and reception. For acts of photography performed under authoritarian regimes are complicated by the fact that the sovereign power seeks to control the publication and interpretation of photographs of any event (through framing and captioning) or act that seeks to undermine its legitimacy. A more confrontational curatorial approach serving to reconstruct the trajectories of editing, captioning, and publishing, or the attempts of the apartheid regime in reframing or preventing any publication whatsoever, might have been more productive in arousing critical and historical curiosity among visitors than the obvious chronological approach (even including some pre- and post-apartheid photography) in which many photo-journalists and occasional documentarians have, in retrospect, been safely elevated to the status of artist. Works critical of apartheid by “real” artists are included as well (Hans Haacke, Adrian Piper, William Kentridge), as are a large number of lengthy films and videos, most of which are uncomfortably shown on small wall displays. These works shed an interesting light on apartheid and image culture but don’t contribute to an understanding the “bureaucracy of everyday life”. Double page from DRUM magazine, March 1977, pp. 22-23. One category shining by absence is family photography by means of snapshots or private photo albums from the apartheid era—a category par excellence to reveal the effects of apartheid’s bureaucratic order on everyday life. The majority of the people just went about their daily business in spite of many restrictions, whereas a minority of youngsters climbed the barricades to protest or to document injustice. 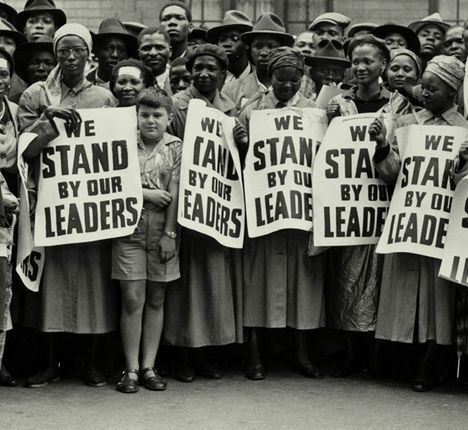 Most of the photographs on display are still showing blacks and coloureds as victims, in spite of the fact that many of the pictures were shot by black South Africans critical of the regime. Protests and uprisings were exceptions rather than part of the fabric of everyday life. 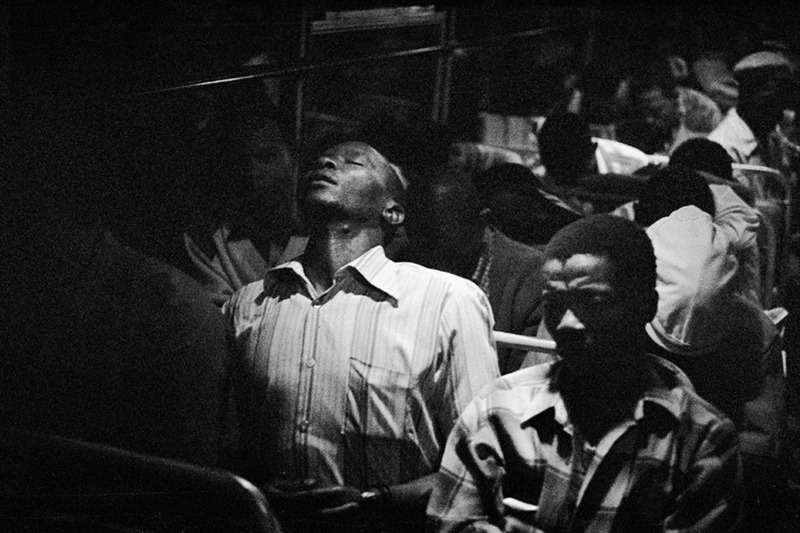 The Transported of KwaNdebele (1983–84) by David Goldblatt is one of the few series showing an exhausting effect of apartheid’s legislation on the daily lives: poor blacks travelling all too long hours to and from work in the darkness. Cover photograph from David Goldblatt, The Transported of KwaNdebele, 1983. The exhibition doesn’t quite meet the ambitious tasks set: to critically interrogate the apartheid regime’s “normative symbols, signs, and representations” and, as Okwui Enwezor writes in the upcoming catalogue’s introductory essay, “to hold up the photographic document for scrutiny—in other words, to read the image, both within and against its intentions”. However, despite its shortcomings and pitfalls, “Rise and Fall of Apartheid” invokes powerful and often touching photography and constitutes an impressive anthology of about four decades of resilience and resistance in a complex society on the (permanent) verge of catastrophe. It may function as a thoughtful reminder of how important various practices of serious journalistic, essayistic, and artistic photographic documentation remain in the face of oppressive political regimes or gross economic injustices—particularly in the age of the alleged immediacy of digital and social media. For as Peter Magubane has said: “A struggle without documentation is not struggle”. Likewise, struggles whose stories and images are not being carried on through generations cease to be struggles. *This exhibition review appeared in Camera Austria International No. 120, Dec. 2012, p. 70.